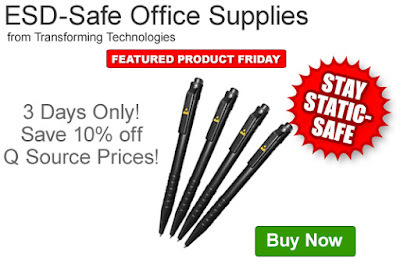 Save an extra 10% off the Q Source price of Transforming Technologies ESD-Safe Office Supplies. Our FPF102816 Coupon Code is auto applied when you add an eligible office supply product to your shopping cart. This Featured Product Friday (FPF) promo is valid from today, October 28, 2016 through Sunday, October 30, 2016 and the code is unlimited use. This selection of ESD-Safe Office Supplies from Transforming Technology, includes ESD-safe ball-point pens, sheet protectors, trash can liners, and a stainless steel cleanroom waste basket. Don’t let non-ESD-safe versions of these common office items be the cause of expensive static damage in your work environment. Follow our weekly FPF selection on The Q Source Resource Blog, via our email newsletter, or on our social media accounts. Please help us spread the word about Featured Product Friday by sharing the FPF code with your friends and colleagues. Click here to shop, or for further questions about Featured Product Friday, please read our informational blog post, call us (800-966-6020), or send us an email. Please note: This promo is valid only at QSource.com and expires on October 30, 2016.